Ballard’s Ghost Light Originals offers up a provocative night of entertainment with its revision of Calderon de la Barca’s Life is a Dream, written during Spain’s Golden Age of Theatre in 1635. After a somewhat slow exposition, the play settles in to provide a multi-faceted story that explores the tensions between love and duty, the burdens of meeting one’s fate and the mystery of mankind’s perceptions of reality. 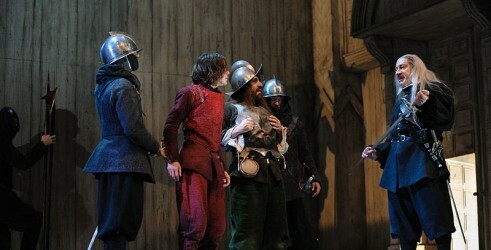 Robert Hankins assumes the role of Segismundo, who is imprisoned in a tower by his frightened father so that his son won’t fulfill a dire prophecy that has him bringing destruction to his empire. Hankins’ opening monologue describes the austere world in which he lives in lonely abandonment. His part is nearly Shakespearian in scope as his character struggles with alienation, seething bouts of rage and a broken heart. Segismundo also must determine what is his real world and what is merely a “strange and lovely dream.” Hankins is more than up to the task and provides a solid, thoughtful performance throughout.